The United States' foreign policy has often had a direct and strong influence on the history of immigration to the country. This impact is particularly evident in United States-Asia relations from the mid-19th century through World War II. The three key factors affecting U.S. foreign policy toward Asia during this time were territory, trade and a constant tension in public attitudes regarding internationalism versus isolationism. 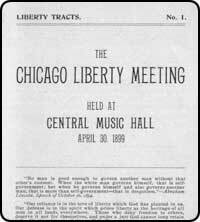 A call for a meeting of the Anti-Imperialist League in 1899. America's mid-19th Century expansionist agenda of "manifest destiny" seemed to be fulfilled with the conclusion of the Mexican-American War in 1847. The borders that make up the lower 48 had been secured. But from 1857 to 1910, the United States acquired 13 islands or island groups in the Pacific Ocean, in addition to the purchase of the Alaskan Territories from Russia in 1867. The Spanish-American War in 1898 resulted in the United States' extending its reach as far as the Philippines. After a short series of battles with the failing Spanish empire and the signing of the Treaty of Paris without Filipino representation, the United States fought a short war with the Filipino independence movement and declared the islands to be American territory. Soon after, the Hawaiian Islands and Guam were annexed. Americans were in full consideration of their own role on the global stage and whether or not they were natural inheritors of the tradition of empire that had come before them. The Anti-Imperialist League formed at this time, composed of prominent individuals of the period, including Mark Twain, Andrew Carnegie, Samuel Gompers, and Jane Addams. International trade was a major factor in these considerations. In addition to being the leader in industrialization, by the turn of the 20th century the United States had become the major agricultural exporter in the world. A strong desire to increase international trade fueled the debate as to whether maintaining that prominence in agricultural exports would be best accomplished through both territorial expansion and an economic push for market expansion. Secretary of State John Hay, under President William McKinley, authored the Open Door Policy, which came to dominate American foreign policy in Asia. The policy was essentially a memo, titled Open Door Note, that was first sent to London, Berlin and Saint Petersburg in 1899, then later forwarded to Tokyo, Rome and Paris. It stated that (1) China was to be kept open to trade with all countries on an equal basis; (2) no country should interfere with any of the treaty ports in China or with any other vested interests; (3) Chinese authorities were permitted to collect tariffs on an equal basis; and (4) the Chinese should show no favoritism to their own nationals in the matter of harbor dues or railroad charges. Of the six recipients, only the British accepted the Open Door Policy. Based on Britain's support, Secretary Hay declared the policy to be in effect, but America had no way of enforcing it. The Open Door Policy reflected a mix of sentiments that Americans were trying to define for themselves. On the one hand, many Americans were anti-imperialist, having established their own nation state by gaining freedom from being a colony. On the other hand, as the nation grew, economic and social interests looked to grow the country's prominence and prosperity in comparison to other nations. 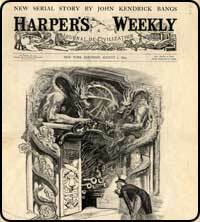 A cover of Harper's Weekly warning against The Open Door Policy. In 1900, the United States sent troops to assist the Europeans and Japanese in suppressing the Boxer Rebellion. Hay was concerned that the incident would result in China's dismemberment and would threaten the Open Door Policy. He sent a memo declaring U.S. support for a solution that would "preserve Chinese territorial and administrative integrity" as well as "equal and impartial trade with all parts of the Chinese empire." These ideas became the cornerstones of foreign policy with Asia and remain so to this day: open trade with China and the preservation of territory. The resulting indemnity that the Europeans and Japanese imposed upon the Qing dynasty to pay for the loss of life and property amounted to a crushing $333 million. The United States received $25 million of that amount, of which $11 million was given to American colleges to support Chinese students. In 1904, the Russian-Japanese War became another test of America's Open Door Policy. Japan, afraid that Russia would threaten its ambitions in China and Korea, launched a surprise attack against the Russians in Manchuria and occupied Korea. Theodore Roosevelt offered to mediate and brought the two parties to Portsmouth, New Hampshire. There they signed the Portsmouth Treaty, which gave Manchuria back to China and resulted in Russia's conceding Japan's right to dominate interests in Korea. The 1905 Gentleman's Agreement with Japan, or the Taft-Katsura Agreement, reflected U.S. recognition of a rising, powerful, modern Japanese nation. The Gentleman's Agreement provided for mutually agreed-upon criteria for Japanese to be allowed to immigrate to the United States. The Gentleman's Agreement also recognized Japan's claim to Korea and the United States' claim to the Philippines. Cynicism in international affairs befell the American public at the conclusion of World War I and seriously curbed America's imperial ambitions. Internationally, imperialism of any brand, whether European, American or Japanese, could not be reconciled with the determination of grassroots democracy movements and ethnic nationalism. The Treaty of Versailles and Wilson's visionary but deeply flawed Fourteen Points for the League of Nations epitomized this irreconcilable clash. Also, the Russian and Bolshevik revolutions challenged the future of capitalist enterprise. The subsequent economic crash of the 1930s confirmed for many around the world that becoming too intertwined in the world's problems was confusing, leaving one's own interests vulnerable. While many parts of Europe turned to communism and fascism, Americans reacted with strong isolationist and nativist attitudes. This nativism resulted in a series of increasingly restrictive immigration policies. The precedent set by the Chinese Exclusion Act in 1882 continued. American workers felt very threatened by immigrant labor and lobbied Congress to pass legislation after legislation to make entry into the country more difficult. Employers and business interests were, naturally, more in favor of the cheap labor opportunity that immigrants provided. But just as the vote to join the League of Nations and its multilateral internationalism failed as a matter of foreign policy, likewise Americans increasingly interpreted foreign elements of any sort to be detrimental on the domestic front.